Route 66 is the mother of all highways in the USA, cutting across the nation from coast to coast through small towns and scenic vistas. Though it’s since been eclipsed by the interstate highway system, it’s captured a special place in history for making the trans-American highway a reality. 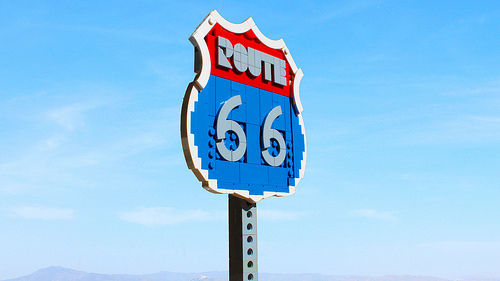 LEGO builder hachiroku24 brings us back to Route 66’s glory days with an awesome rendition of the highway marker sign, part mosaic and part sculpture. The excellent use of the 4×4 quarter-circle macaroni tiles lends both the numbers and shield outline just the perfect curves.